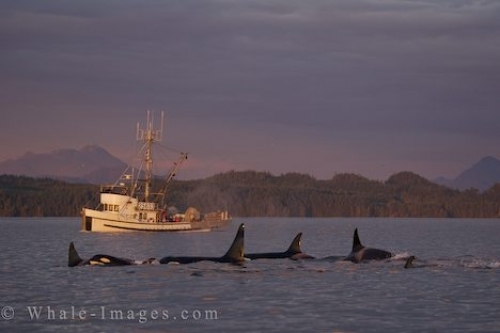 As a commercial fisherman heads home in the sunset lighting after a long day off Northern Vancouver Island, a pod of Killer Whales belonging to the Northern Residents surfaces close by. The sunset lighting reflects off the surface of the ocean off Northern Vancouver Island in British Columbia where a pod of Northern Resident Killer Whales have congregated. While the pod travels through the calm waters to places unknown, a commercial fisherman passing by, slows down to watch these beautiful marine mammals in their natural environment. The Northern Resident Killer Whales are a fairly stable group with a population of around 220 animals. The other main group of Killer Whales seen regularly in the waters off Vancouver Island, more so around Victoria, British Columbia, are the Southern Residents. Two other species of Killer Whales occasionally seen throughout these waters, are the Transients and Offshores, both which tend to only linger in the area for a short period of time. The Northern Residents are made up of three clans, A, G and R all which have different dialects and are divided into 16 separate pods, 10 in the A clan, 4 in the G clan and 2 in the R clan. The final step in the social structure of the Northern Resident Killer Whales and for easier identification, is they are then separated into 18 matrilines. The Southern Residents are made up of three large pods, J, K and L which are then divided into subpods. Each subpod has been grouped around the matriarch or oldest female in the pod as the Killer Whales remain with their mothers throughout their entire life. The Northern Residents separate and spread out when foraging as they generally fish alone. They will still follow the same direction and will eventually regroup for resting, traveling and playtime when the matriarch calls. Tours leaving from the northern end of Vancouver Island are offered from the end of June through to October, where passengers can view these beautiful marine mammals for themselves. The crews aboard these tours are very knowledgeable about the different pods of the Northern Resident Killer Whales and how to locate them. This commercial fisherman is one of many which travel the waters off Northern Vancouver Island during the summer, along with various other types of water vessels, all which need to pay close attention to any Killer Whales in the area. If everyone in these waters abides by the proper boating rules when around the Killer Whales, these beautiful animals may be here for hundreds of years to come.